As usual, I let my mostly untrained canine pick the recipient of the thrashing to come. She has been doing pretty good until now. This choice was Barbara Boxer (Dumbass-CA). NO BEGGIN' STRIPS FOR YOU! "Her" website HERE. Her only true claim to fame has been that her daughter, Nichole, married the brother of Hillary Clinton, Tony, in 1994. They spawned one child and then divorced. I'm guessing drugs or whoring, but who knows. "Her" website claims that she wrote the LAW creating the first afterschool programs for indoctrinating YOUR children in the ways of the Leftists. Since she doesn't understand the process, I'll explain it to her. No elected person WRITES law. They write BILLS. And the only way her bill became law is that her daughter's brother-in-law (by marriage) was the President. Pay-off? You betcha. "Her" website also says that she wrote the LAW that allows pilots with special training to carry guns. Even though this bill originated in the house, she says that she wrote it. Odd, because she is a damn SENATOR. But, not odd, because she is a liar. Sorry folks, I can find no truth at all to her claims on her website. Everything that is published there is blatantly false. Go figure. 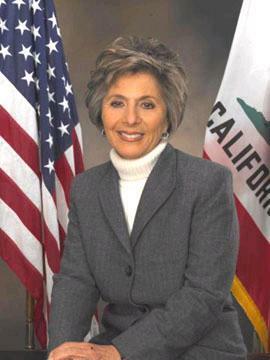 Future President 2020, Travis Benning, wanted to add some things to this discussion of the lovely and popular Senator Boxer, so go HERE NOW. Travis delves into the contradictions on Boxer's beliefs in abortion and her claims of being an advocate for the family. He also takes Ms. Boxer to task for blaming the United States for the terrorist attacks on our country. Read it NOW. Boxer is by far one of the glaring mental lightweights in the Senate and the voters of California should be deeply ashamed. Her stance on gun control puts her in the camp with other mental midgets like Chucky-Baby Schumer. Who actually thinks gun control does anything other than endanger law abiding citizens? Boxer advocates gun control because she hates Black people. An old trick play from the Kanye playbook! Also on the uninformed and ignorant side of the embryonic stem argument, she just FEELS that there is a cure for Alzheimer's there despite the evidence and the professional opinions of every doctor and scientist involved in that research field. Boxer shares the belief of the majority of her fellow Jews that abortion should be the first choice of any woman that mistakenly becomes pregnant. Oh, wait, no most Jewish folks think that abortion is murder, so I don't really know where she got those ideas. Maybe it is from her days as a press journalist. Yep, she was a journalist for the Pacific Sun. No wonder. On to part two. Barbara Levy was birthed on November 11, 1940 in Brooklyn, New York. She is a graduate of Brooklyn college with a degree in economics. Having obviously slept her way to a degree, she was a stockbroker for only three years while her husband Stewart went to law school. She was the person for which the title "broker" was coined after losing every single cent of her clients' money. After proving herself to be a terrible judge of any kind of money matters and investment in general, she was fired to make way for a well-trained chimpanzee that chose investments by throwing dung at the big board. He was much, much more successful than BB. After being removed from New York by court order, Barbara and husband Stewart settled in California because of all the free love and drugs. Oh, and she promised to retire from the Senate in 2004. Uh, it's 2005. Goodness, how many more of these losers do we have left? Butcher's Bill of Democrat Senators: Akaka, Daniel-(D-HI), Baucus, Max-(D-MT), Bayh, Evan-(D-IN), Biden, Joseph-(D-DE), Bingaman, Jeff-(D-NM), Boxer, Barbara-(D-CA), Byrd, Robert-(D-WV), Cantwell, Maria-(D-WA), Carper, Thomas-(D-DE), Clinton, Hillary-(D-NY), Conrad, Kent-(D-ND), Corzine, Jon-(D-NJ), Dayton, Mark-(D-MN), Dodd, Christopher-(D-CT), Dorgan, Byron-(D-ND), Durbin, Richard-(D-IL), Feingold, Russell-(D-WI), Feinstein, Dianne-(D-CA), Harkin, Tom-(D-IA), Inouye, Daniel-(D-HI), Jeffords, James-(I-VT), Johnson, Tim-(D-SD), Kennedy, Edward-(D-MA), Kerry, John-(D-MA), Kohl, Herb-(D-WI), Landrieu, Mary-(D-LA), Lautenberg, Frank-(D-NJ), Leahy, Patrick-(D-VT), Levin, Carl-(D-MI), Lieberman, Joseph-(D-CT), Lincoln, Blanche-(D-AR), Mikulski, Barbara-(D-MD),Murray, Patty-(D-WA), Nelson, Bill-(D-FL),Nelson, Ben-(D-NE), Obama, Barack-(D-IL), Pryor, Mark-(D-AR), Reed, Jack-(D-RI), Reid, Harry-(D-NV), Rockefeller, John-(D-WV), Salazar, Ken-(D-CO), Sarbanes, Paul-(D-MD), Schumer, Charles-(D-NY), Stabenow, Debbie-(D-MI), Wyden, Ron-(D-OR).